Lee: Please tell us about your Crystal-Kite-winning book! 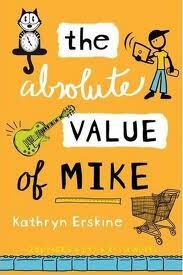 Kathy: THE ABSOLUTE VALUE OF MIKE is about 14 year old Mike who has a math learning disability and a father who's a math genius. His father sends him to relatives for the summer to work on a math project ... which turns out to be something completely different. With his new quirky friends and relatives, Mike is able to discover his own real value. Kathy: I joined SCBWI in 1997, I think, as soon as I decided to write for kids. It has been immensely helpful. In addition to the publications on craft, marketing, etc., which are great, the people are what make it such an indispensable organization. When I want to chat with other authors or ask questions, I can go to the site; if you want to take a craft workshop, the SCBWI has many (I'm going to one next week, as a matter of fact! ); and when I want a chance to meet other authors, as well as editors and agents, I go to SCBWI regional or national events. And I'm grateful for the numerous contests and grants offered, too--such a supportive organization! Kathy: Yes--if you're not yet published, don't give up! Mine was a slow path to publication and I think that's true for a lot of people. I published a book through PublishAmerica (which I would not recommend) in 2004, and Quaking came out with a traditional publisher in 2007, ten years after I took my first class in writing for kids. MOCKINGBIRD and THE ABSOLUTE VALUE OF MIKE have published since, and I'm now fortunate to have a two book contract for my upcoming novels. It takes practice, to be sure, but it also takes determination. Luckily, it's a fun community to spend time in -- both the SCBWI and children's writers in general. March—Children’s Literature Panel at The Virginia Festival of the Book; April–New Member Welcome/Regional Get-together; May—Illustrator’s Day; June—Novel Revision Retreat, and October—Fall Conference. As time and resources permit, we offer craft-focused workshops and CritiqueFests for writers and illustrators. Also throughout the year, our PAL Coordinator organizes special events for our Published and Listed members. A lawyer in search of a creative outlet, Kathy Erskine has been writing for a long time. She joined SCBWI in 1997 and attended our first-ever Novel Revision Retreat in 2004. I believe she was working on Quaking at the time. Kathy has never said “no” to anything we've asked her to do for our local events. MoiraDonohue, whose six-book series VIRGINIA, MY STATE Biographies comes out this month, met Kathy in a Fairfax County “Write For Children” class. When it was over, they started a critique group together. 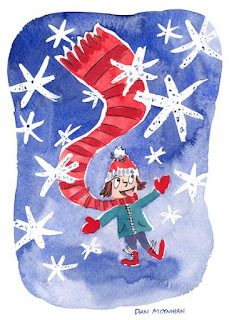 You can check out Kathryn Erskine's website and blog, and find out more about SCBWI Mid-Atlantic at their website here. My thanks to Ellen for rounding up the great insights, and Cheers to Kathy for winning the Crystal Kite Member's Choice Award for her novel, THE ABSOLUTE VALUE OF MIKE! The 2012 Don Freeman Grant Recipients! Don Freeman was a renowned illustrator and early supporter of SCBWI. He established this award to help picture book artists further their training and work towards publication. This year's Don Freeman Grant winner is Dan Moynihan! "...I love the art. It's a nice range from humor to sweetness and I think he definitely has a bright future as an illustrator." "I think he might be a great candidate for middle-grade novel interiors, especially for boys. He reminds me of Christine Davenier, and there's a real charm to his work." And this year's runner up is Brooke Boynton Hughes! "Adorable art! Very sweet and some truly stand-out images." "Her work looks professional! I like her draftsmanship and her use of space/perspective. She looks like she is ready to roll!" Cheers to both Dan and Brooke! And if YOU are an illustrator working to further your training and get your work published, consider entering your illustrations for the 2013 Don Freeman Grant. Applications will start being accepted in January of 2013, and you can find out more here. Lee: Hi Vicky, congratulations! Please tell us about your book! Vicky: Cleopatra's Moon is the story of Cleopatra's daughter--a real person in history--and what happened to her after her parents (Cleo and Mark Antony) died. It's historical fiction set in both Egypt and Rome. It's also a coming of age story in that the protagonist (Cleopatra Selene) must find her own way--and forge her own identity--apart from the expectations and dreams of her powerful and charismatic parents. Lee: I didn't know they (Cleopatra and Mark Antony) had a child... what a cool launching point for a novel! How long have you been involved with SCBWI? Vicky: I joined SCBWI in 2005. Vicky: It's hard to talk about what I've gained from SCBWI without sounding trite but it's all true! SCBWI changed everything for me. I jumped into writing a children's book without having any clue what I was getting into. Somewhere along the way, I stumbled across SCBWI and immediately joined. I discovered that an RA from the Mid-south region (Tracy Barrett, who is now SCBWI's Regional Advisor Coordinator) had also published several books about the ancient world. I emailed her and within minutes received the kindest, most helpful response I could've imagined. She even gave me the name of one of her nonfiction editors. Nothing came out of the contact, but I was gobsmacked by how quickly this stranger was willing to jump in and help me! I have had that experience again and again. I eventually got that first nonfiction book published and SCBWI came to the rescue again with my second book. The contracted publisher for that book closed its doors when the economy tanked. I had to find another publisher for the book I'd already sold once. Having attended a Southern-Breeze conference months earlier, I sent the manuscript to an editor who had been our keynote speaker. He requested the entire manuscript and ended up publishing it. It never would have occurred to me to query that editor had I not attended our regional conference. SCBWI saved me again when I was working on my first novel (Cleopatra's Moon). 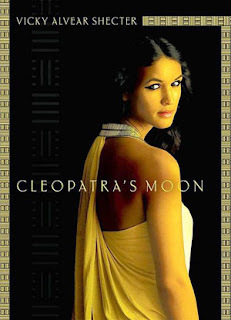 I almost gave up writing it when I discovered that a famous historical-fiction author was also putting out a book based on the life of Cleopatra Selene. Despite the fact that this author wrote for adults, I felt defeated and hopeless. How could I compete? But my SCBWI friends wouldn't let me quit. They insisted I continued working on it, reminding me that just because a topic had been covered before, didn't mean it could never be explored again. They also reminded me that since I was writing for YA, I would have a different "take" on the character and events. They were right, of course. And I'm forever grateful for their faith and wisdom! Lee: Great stories! We love hearing "SCBWI changed everything for me." Do you have any advice to share with other children's book writers and illustrators? Vicky: Again, at the risk of sounding trite, I would say do not give up! When I talk to kids about publishing, I always ask them to guess how many publishers I submitted my first book to before I got a "yes." They usually start at five or so. I keep making them go up and up until we hit the magic number--thirty. Imagine, I ask, if I'd given up at number 29? There is always a "yes" after the last "no." Only we don't know when that "last 'no,'" will be, so we have to keep submitting. And submitting. The Southern Breeze Region has more than 600 active members in Georgia, Alabama, and Mississippi. For the Crystal Kite voting we are grouped with Florida, which is a different region, although we do have a few active SCBWI members from the panhandle and northern Florida area who attend our conferences regularly. Our region is geographically broad, and we actively support our members with events in each state, and our PAL members, including Vicky, support our local "schmoozes" as well as our annual spring and fall regional conferences. Vicky has been an active member of our region ever since she joined, and I have known her personally since 2005. She is a cheerful volunteer who offers excellent information and feedback to other aspiring writers. At our regional conferences, she has been an "angel" for Kathleen Duey and Cheryl Klein (who bought Vicky's Crystal Kite winning book), a leader for informal critique groups, and has assisted at our registration table where her smiling face welcomes many who have never been to a conference before. She has also written articles for our newsletter, and posted informative links and comments on our listserve. I recall a really great post and subsequent article about writing what you are moved to write, what you have a passion for, and not giving up just because you find out someone else has also written about the same subject. This had happened to her when she was writing CLEOPATRA'S MOON! Vicky has also been a speaker at several of our local schmoozes -- one of which is occurring right now here in Birmingham! You can find out more about Vicky and her book at her blog, History With A Twist. And you can learn more about SCBWI Southern Breeze here. My thanks to Claudia for the info on SCBWI Southern Breeze, and Cheers to Vicky for winning the Crystal Kite Member's Choice Award for her YA novel, CLEOPATRA'S MOON! Children's author Zetta Elliott started The Birthday Party Pledge to give all children, but particularly children of color, books by and about people of color for their birthdays. 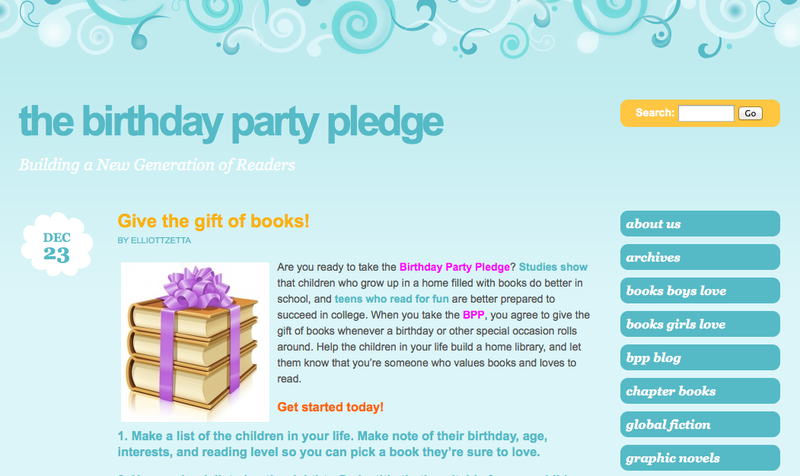 The idea of the Birthday Party Pledge is to create a new generation of readers and to support the works of authors of color and others who write authentic books with characters of color. To help people choose authentic books, the various BPP committee members have created lists of 15 recommended titles for different age levels, genres, and topics. For instance, teen blogger Ari Valderrama of Reading in Color and I created the lists for global fiction and historical fiction, and Zetta Elliott assembled the speculative fiction list. 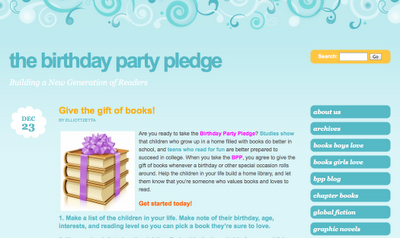 Check it out, be inspired by, and maybe even take the Birthday Party Pledge! Lee: Congratulations on winning the Crystal Kite Award, Sara! Please tell us about your book! 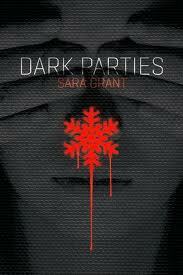 Sara: DARK PARTIES is a dystopian thriller about rebellion and forbidden love. 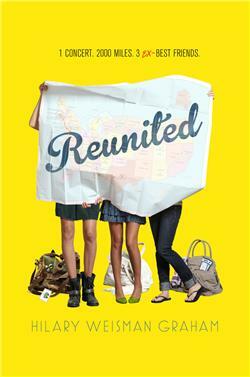 Sixteen-year-old Neva was born and raised in an isolated nation ruled by fear, lies, and xenophobia. Hundreds of years ago, her country constructed an electrified dome to protect itself from the outside world. What once might have protected, now imprisons. Her country is decaying and its citizens are dying. Neva and her friends dream of freedom. A forbidden party leads to complications. Suddenly Neva’s falling for her best friend's boyfriend, uncovering secrets that threaten to destroy her friends, her family and her country -- and discovering the horrifying truth about what happens to The Missing. .
Sara: I’ve been an active member of SCBWI on both sides of the Atlantic for nearly 20 years. I was the Regional Advisor for Indiana for three years and now volunteer for the British SCBWI. I would not be published if it wasn’t for the connections I’ve made and the knowledge I’ve gained through SCBWI. I am the co-creator and co-editor of the British SCBWI’s Undiscovered Voices. It’s a bi-annual anthology of novel extracts from 12 unagented and unpublished SCBWI members. I’m very proud of this initiative. The third Undiscovered Voices anthology was published this past February. From the first three anthologies, 16 of the 36 selected authors have had novels contracted for publication and most have signed with agents. DARK PARTIES appeared in the first anthology in 2008. It’s how I got my agent and ultimately my book deals. I want to help other writers achieve their dreams of publication and Undiscovered Voices allows me to give back to an organization that has meant so much to me. Lee: How great to learn about that, and what a success story! Do you have any advice to share with other children's book writers and illustrators? Sara: Read. Read. Read. Read broadly for the age group for which you are trying to write. Read the classics but also keep up with what’s on bookstore shelves right now. Learn from the current masters of fiction. Revise and polish your manuscript until it sparkles and until you can’t think of any way to improve it. Then give it to a fellow writer whose opinion you respect – better yet find a writers group – and then revise some more. Write. Revise. Rinse and repeat as necessary. Be obsessed by your story. Love your story and characters. Write a story that will continue to intrigue you. But most importantly...believe in your work and never stop learning and improving and writing and rewriting. I wrote my first story for children when my niece Megan was born. I received my first book contract the year she graduated from high school. The most important advice I could give to my fellow writers is – never give up! Sara Grant is the visionary behind the UNDISCOVERED VOICES anthology, now in its third year, promising new and exciting opportunities for fiction illustrators, alongside undiscovered fiction writers. No other project has so single-handedly transformed SCBWI BI’s fortunes and those of so many of our members. UV put SCBWI-BI on the map in the British publishing industry, raising the profile of our organization and in turn that of our members, both published and unpublished. It has opened so many doors. Frequently, Sara says, “I have this idea. Can we do it?” And then she makes it happen. This is the motto for everything she does. Sara is constantly thinking of innovative ways to help our members succeed -- and then helping them to do just that – with tons of enthusiasm and energy. Sara helped to set up the Networks groups, organized the Professional Series for several years alongside Margaret Carey (generously hosting many events at her house), then established the slush pile challenge single-handedly. Sara continues to give time and resources to SCBWI, now leading published members in helping the exciting evolution of SCBWI British Isles into an organization highly-regarded by all sectors of the children's book industry. Many, many people owe a great deal of their success to Sara who is nothing shy of relentless in helping our members achieve their dreams. I am really, really proud that the BI region has won the Crystal Kite for the second year running. It shows the high caliber of our members' work and their dedication to their craft. Sara has been working on her craft for many years and this is her first book so it's an incredible achievement. We are all very excited for her! Sara also won one of the scholarships to attend the SCBWI NY conference this year. You can find out more about Sara and her book at her website, and she invites readers to follow her on twitter @authorsaragrant! And you can learn more about SCBWI British Isles here as well as their Undiscovered Voices project here. My thanks to Natascha for the info on SCBWI British Isles, and Cheers to Sara for winning the Crystal Kite Member's Choice Award for her YA novel, DARK PARTIES! 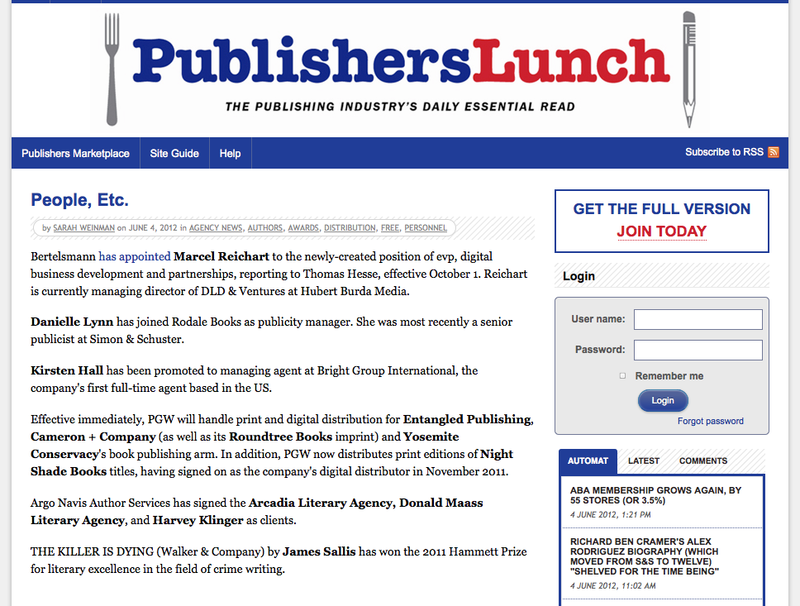 "Argo Navis Author Services has signed the Arcadia Literary Agency, Donald Maass Literary Agency, and Harvey Klinger as clients." What's worth noting is that Argo Navis is an e-publishing service "designed for professional authors acting as publishers, who control the e-book rights to their reverted or not-in-print works" and that authors cannot sign up themselves. Their AGENTS have to be signed up before they can have their works included. 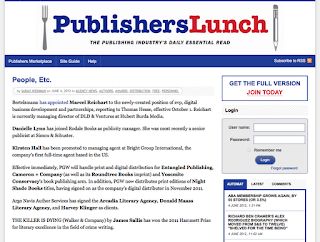 That "ensures that the service is focused on professionals rather than self-published authors." By making literary agents central to their business model, and ensuring their e-books are vetted by the structures of traditional publishing, this announcement gives us one view of how the future of e-publishing is shaping up. Lee: Congratulations, Orel! Can you tell us about THELONIOUS MOUSE? Orel: THELONIOUS MOUSE began with its sonorous title. As soon as I had that, I could see and hear my character. The book grew from the music of my childhood, like many of my poems for adults and children, as well as my picture book with the same illustrator, Anne Wilsdorf, TWO STICKS (FSG, 2007). My hometown, Hempstead, Long Island, NY, was rich in music when I was growing up. Gospel spilled out of Baptist churches, rhythm and blues filled every block, and a prominent bandleader lived just down my street. In high school, we left the choir room still singing in our quartets. During breaks between classes, the hallways resounded with song. I discovered Thelonious Monk, the great pianist/composer, in my late teens. He followed his own compelling path, in spite of the criticism of those who couldn’t understand his quirky genius, just as my little mouse braves his family’s disapproval and even death, in the form of Fat Cat, to make his music… because he simply had to. I, too, write because I simply have to. My file drawers are full of unpublished poems and stories that clamored to be written. I dedicated this book to the memory of a dear friend, the late Jackie Raven (poet, tap dancer, and consummate charmer) who gave me a great piece of advice when I was working on the manuscript: “Make the scats about the cat!” Insulting the cat in rhyming scats was great fun for Thelonious and me (“Bite a bit of bitter old hang-fanged litter-box sitter!”) while it lasted, but we both needed to grow beyond that repertoire. Once he and I discovered the toy piano, he became a true musician. With Fat Cat breathing down his back, Thelonious found the courage to make his art. So, I hope, will all authors and artists. Lee: Beautifully put. Can you tell us when you joined SCBWI, and what impact that's had on you and your career? 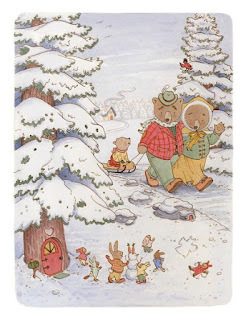 Orel: I joined SCBWI in the early 1990’s, shortly after my first picture book was published. The friends and colleagues I’ve met through the organization have been instrumental in my life. The first time I accompanied my husband on a nine-month working sabbatical in Paris, France, I had friends, but no colleagues. The second time (2008-09) I was a published author and member of SCBWI. I contacted the Paris chapter and was scheduled to give a talk soon after my arrival. In a beautiful apartment overlooking the Park Monceau, where members congregated for the event, I met people who have enriched my life. I became part of a small critique group, was invited to give talks at the American Library and workshops at The American School (to be invited back to the school three years later) and befriended the gifted illustrator, Jeanne B. De Sainte Marie, with whom I am now collaborating (along with French producer, Actialuna) on an animated, interactive, watercolor poetry app (A WORD'S A BIRD) for the iPad. While researching potential producers for our project, Jeanne and I were impressed by the work of Auryn, Inc., but they did not produce original projects. However, they adapted my first two out-of-print children’s books for the iPad, SINCE LULU LEARNED THE CANCAN and THE PERILOUS PIT (Simon & Schuster, 1991 and 1993) and TWO STICKS (FSG, 2007) is forthcoming. It is a great pleasure to see old books get new lives. My hope is that print publishers and digital media producers will find new ways to collaborate and enhance each other’s contributions to children’s literature. I regularly attend the Metro NY SCBWI Tuesday lecture series, an invaluable way to connect with peers, agents and publishers, as are the annual and regional conferences. Thanks to a fellow SCBWI member and friend, Sandy Lanton, who encountered a publisher at the LA conference she thought would be perfect for a manuscript of translations of Chinese poetry with related history I’d been working on with co-author/illustrator Siyu Liu, that book found a great home. A THOUSAND PEAKS, POEMS FROM CHINA (Pacific View Press, 2003) was chosen by the New York Public Library for its “Books for the Teen Age” list. A highlight of the awards ceremony for me was meeting Phillip Petit, the man who walked between the towers, whose book was also being honored. He told me that preparation is all, not courage, whether you are three feet off the ground or thousands of feet. SCBWI does more than prepare authors and illustrators to enter this profession. It makes us part of a warm and vibrant community. Thanks to SCBWI, we are not isolated. It’s an incomparable honor to be awarded a Crystal Kite, 2012, by the members of the Metro New York region. Children’s book writers and illustrators are the most generous colleagues one could wish for. I thank SCBWI for keeping us in touch, informed, and united. Lee: Do you have advice to share with other authors and illustrators? Orel: Who am I to give advice to anyone? I have always followed my own idiosyncratic path, writing whatever I was moved to write, tossing away thousands of pages of a novel (still unpublished) and starting over. This is not an efficient method of working, so I can’t recommend it. But writing for my “career,” to fill a perceived need, could never have worked for me. If my heart isn’t in an enterprise, I simply can’t do it, just as I can’t follow a recipe precisely when I cook. I have to make it my own. If you see writing/illustrating as a way to make money, there are many far easier paths to that goal. But if you are compelled to write/draw/paint and life seems incomplete without your art, then by all means pursue it. Make the time, even if you can only manage thirty minutes a day. You will be laying down the first sturdy blocks of what may, in time, become a tower of words and/or images that you can climb and climb. Taking a long walk every day helps, too. You never know what you will discover along the way. In the same way, when you write or draw, you never know where the next stroke will take you. If you have the courage to be yourself, like my little mouse, Thelonious, you can’t help but be one-of-a-kind, because there is no one in the universe exactly like you. Well, perhaps there’s a copy of you in an alternative universe, another planet, but, alas, I don’t write fantasy or science fiction. Not yet, anyway, but I may surprise myself one day. I wish the same to you. Lee: Thank you Orel. I love that image, of a tower of words, built day by day, that we can climb! Metro NY Chapter has around 1500 members, including Manhattan, up north to Westchester and all of Long Island. Orel is one of our Long Island Members. Our chapter presents a monthly Professional Series, where we invite speakers related to the children's writing and illustrating industry to give an hour talk, followed by questions and answers and then a social half hour each month from Sept through June. We've had authors, editors, illustrators, art directors, agents and marketing specialists as speakers. We have held, in the past, an Illustrators Intensive Day and this year we are hoping for a Writer's Intensive Day. Orel often attends the Professional Series, and I was in a class at the New School with her years before with teacher Margaret Gabel when she was working on THELONIOUS MOUSE. You can find out more about Orel and her books at Orel Protopopescu's website. And visit Metro New York's site to find out more about this vibrant SCBWI region! 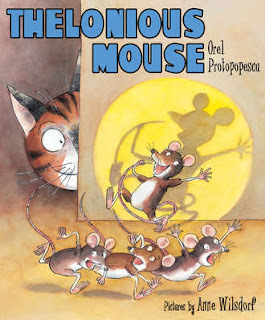 My thanks to Pat for sharing about Metro New York, and Cheers to Orel for winning the Crystal Kite Member's Choice Award for her Picture Book, THELONIOUS MOUSE! Applications are now being accepted for the 2012 SCBWI Book Launch Awards! Hilary Graham formed a BAND - a boy-band that in her book Reunited was fictional... but she used her 2011 Book Launch Award to actually produce two of their songs, and even take the no-longer-so-fictional band on her book tour! Find out more about Hilary's creative marketing here! 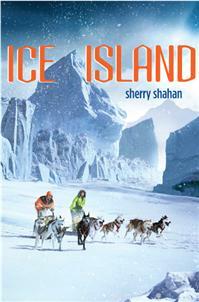 And Sherry Shahan used her 2011 Book Launch Award to give herself the time to promote her latest adventure novel Ice Island. In addition to contacting schools and creating a blog for educators, Sherry tied her story featuring teen mushers and their faithful huskies into the IditaRead project, which this year had over 4,700 student participants for a total race mileage (minutes reading) of 4,869,905. Read more about Sherry's adventures in launching her book here! And now it's your turn... What would you do with a budget to promote YOUR book launch? Would you create a launch event? A book tour? Curriculum materials? Advertising? A Book Trailer? A website? Would you donate books to schools or libraries? If you've got a book coming out in 2013, write up your plan... and maybe you'll win the SCBWI Book Launch Award to make that plan a reality! The SCBWI Book Launch Award provides two annual awards of $2000 each for an author or illustrator to use for marketing a book scheduled for release during the next calendar year. The money can be used for any kind of promotional purpose that will increase sales and visibility of the book, such as launch events, speaking engagements, book tours, curriculum materials, advertising, book trailers, website development, or community events. With this award authors and illustrators can now take their marketing strategy into their own hands, something that is becoming increasingly important due to the ever-shrinking availability of marketing dollars in most publisher's budgets. Check out all the details here, and apply! Note that the application deadline is July 1, 2012.